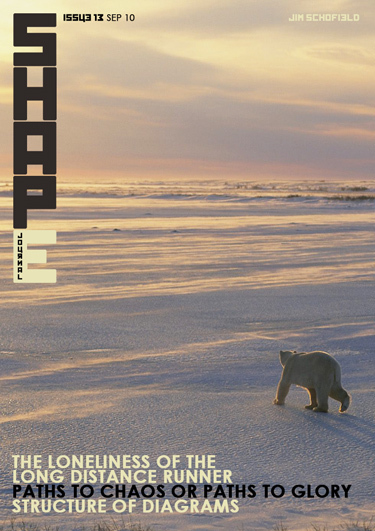 Welcome to Issue 13 of SHAPE Journal. The new paper in this issue is entitled The Loneliness of the Long Distance Runner, and is about the isolation of the serious researcher, and the demands imposed on such by the universally agreed consensus. The latter is shown to be quite naturally opposed to the truths revealed by non consensus-determined research and is predominantly second-hand and over simplified with rationalised justifications rather than established evidence, both conceptually and in its research procedures by a generally agreed subscription to Plurality. The options are that the researcher bows to the dominant consensus, and fits his.her work wholly within it, or is driven by the necessity of the chosen area, and hence is generally isolated from an intended audience. The subject of that paper is the mechanisms which give rise to Emergences and is meant to persuade those who have strong positions on the sort of areas that our Journal addresses to submit them to SHAPE for publication.